Hey! This is a campaign I've ran a few times and has had a positive response. It is a mixture of combat encounters and role-play. It's quite a straightforward story where you can have some fun character moments. This is a pretty easy campaign which can be done in around 4-5 hours (that's how long it's usually been for me). It's not very tricky to GM and you only have to control a few NPCs. Combat isn't incredibly hard (or at least not in the campaigns I've ran), but it should be pretty easy to scale up; either increase the damage or health of enemies (and the last two encounters feature spawning minions, so you could increase the amount that spawn). "You have been hired by a group of bug exterminators named 'Bug Boys Inc' to try and clear out an infested town. You can choose to either work full-time for this company or be hired for just one job." You start next to Sam Chuckle: the guy who has hired you for this campaign. He owns a Bug Company and this is the setup to the campaign, you can skip this starting conversation and go straight to the first encounter but this is a nice time to let people do a quick bit of role-play. "So, you ever hunted/killed bugs before?" If they are working full-time for this company he is your full time employer, which can lead to fun role-play. Has bug spray for actions, but this only is usable in the final couple of encounters. I'll explain more when relevant. Sam is an average nice gnome who will generally try to be the straight man to the party. He should be used to show how certain encounters work and will be there to help guide your players and also be somebody to role-play against. If he doesn't die before the final encounter he will prove himself to be incredibly useful. If Sam dies, say that the players will still be paid by the people that Sam got the job from. This encounter is pretty important to the entire campaign, as it will introduce a very fun subplot if done correctly. Generally I find it easy to get this to work, but it may require a little bit of effort. You move upwards after finishing your little introduction part with Sam and see a large fruit tree. Tell the players that the tree has many different kinds of fruits; apples, oranges, pears, whatever else. If they want to investigate the tree, tell them they realize that it's clearly magical and if they roll high reveal the tree contains blood magic. Have them notice an incredibly delicious and juicy red apple. If somebody takes the apple have the witch which owns this tree appear from the bushes. If nobody takes the apple and this is taking long, have the witch appear and offer the apple. She asks for you to 'pay' for the apple and when they ask what they are paying in tell them 'blood'. 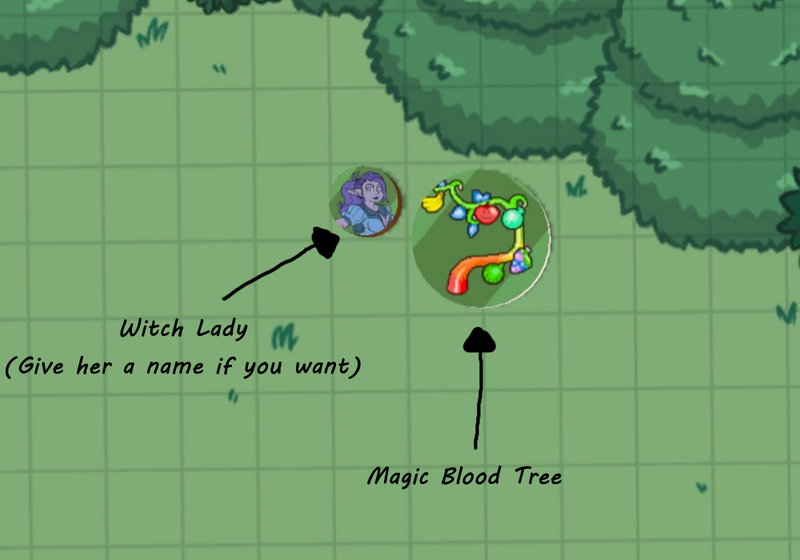 If they actually give the blood the woman will pour it on the tree and thank the player. If your using legendary items you could have the woman give their legendary item if they do pay for it and also eat the apple, though you could wait a couple of encounters and have the woman reappear and give it.if needed. If they pay and don't eat the apple, have the woman wait before reappearing and trying to get them to eat the apple again. If they don't take the apple or don't pay, you could just offer a different similar apple to another player. Or forget about this side-plot altogether. If they attack the witch, start combat but the witch is fairly weak. If they kill the witch give everybody one legendary roll. Now it's time to move on. After this if somebody ate the apple have them suddenly start being sick whenever they roll low or at least start feeling sick. I usually have my player constantly puke throughout the campaign just to prove I've not forgotten about the apple. Alright we've reached our first encounter! When they move up there should be two Dwarfish guards at the top of the bridge. These guys are all bandits but they will claim that they are legitimate businessmen and will get infuriated if called otherwise. They will demand money to let the party pass, and you can have a little bit of role-play if your party want to attempt to diplomacy their way across the bridge. However, you should make it hard to do so. Don't let your players actually have gold on them unless they both have a good reason why they should and then roll well. You can feel free to split your players here a little, as in let one go 'talk' to the boss who is in the middle of the bridge and have the rest of them wait on the other side. 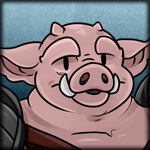 The boss of this bandit group is simply for role-play, he's not different in any other way. This campaign is a fun encounter that will look way more dangerous than it is. If they successfully diplomacy allow them halfway across the bridge before four sharks attack. If they are unable to, have the Dwarves attack along with three sharks. This encounter will work with whenever somebody falling in the water they will death roll from the sharks who will just attempt to eat them. Have the Dwarves instantly die without a death-roll if they fall in. 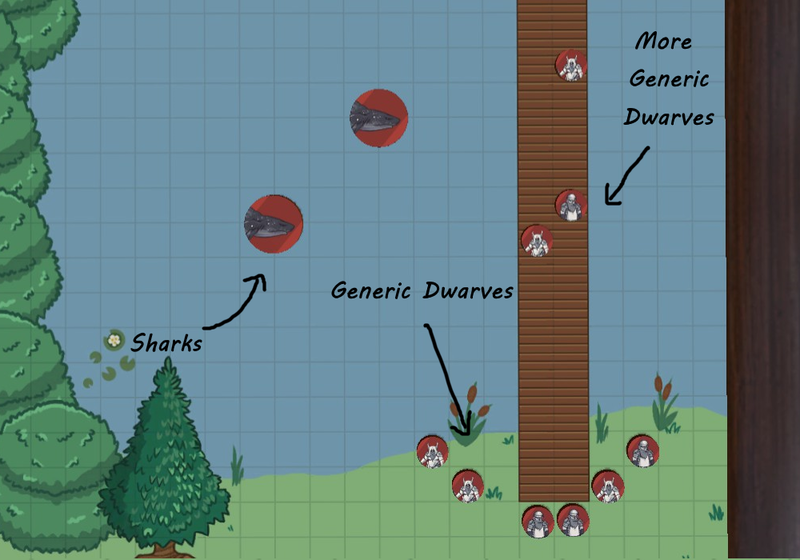 I like using NPCs to showcase the 'gimmick' of the encounter so if the Dwarves are on the team have one fall in and have the shark instantly anytime to eat him. If the Dwarves are not on your team have them throw Sam in the water and have him deathroll unless the players want to use an anytime to save him. This gives the player a fair warning about how the encounter works. 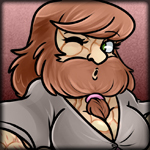 If diplomacy failed the Dwarves will just try and push the party in as a roleplay actually. If they roll higher than a 10, allow them. > Since the bridge is narrow if somebody tries to pass through tight spaces or move past 2 people have them roll to move past. You want to have Dwarves constantly trying to move past each other on the crowded bridge and just falling in to up how dangerous this combat seems as the Dwarves instantly die when they fall in. > If Sharks are on land, have them take double damage and use their regular action to get back in the water. on their turn They cannot anytime on the land. > Try and put Sam in danger a bunch, if the player party manage to keep him alive it's a reward for later encounters where he is more useful. 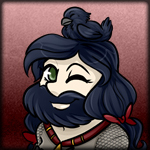 When this encounter is finished feel free to have a bit of role-play where Sam comments on anything notable that happened or if diplomacy is successful you can say goodbye to the Dwarves. 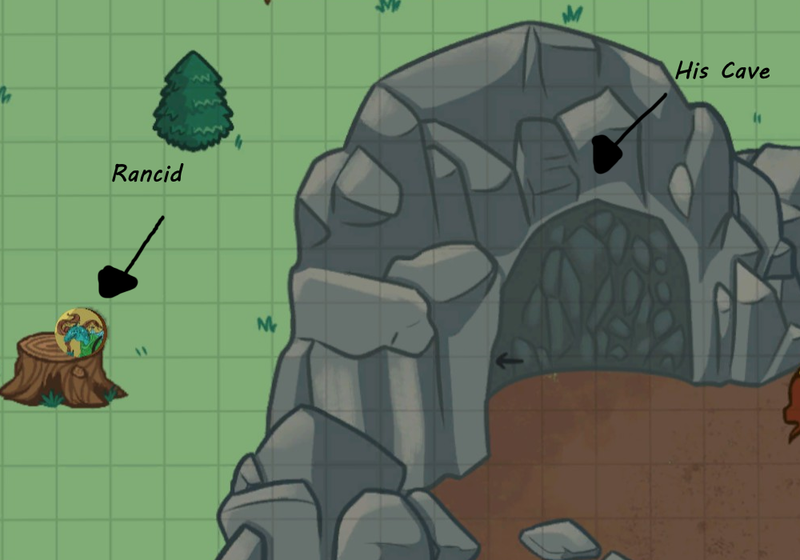 You meet a Gnoll standing outside a cave meditating, this Gnoll is called 'Rancid' and he is searching for somebody full of heart and courage. He will tell the first player to approach him that he is searching for somebody brave and he has been searching his whole life. I generally play Rancid as mysterious and wise, however I've also played him as a little crazy and unhinged based on how the conversation goes. 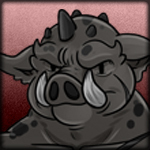 Rancid will say that he has a test for the player and that they want to prove their bravery they should enter the cave. As soon as they step in the cave ask the player what is their characters greatest fear. As they enter the cave, their characters sees whatever their greatest fear is. If you do not have legendary items prepared have them Meta roll (this means only one dice and no using abilities to reroll it) and if they roll a 20 have Rancid give them a Legendary Spell Scroll and have a role-play where he asks to train the character as his apprentice. If you do have legendary items prepared have them Meta roll until they either roll less than a 10 (then they leave the cave) or a 20 (and they get their legendary item and a role-play where he complements and asks to train the character). > There's been a few weird fears I've been told but you can usually think outside the box for a way to display their fears. If somebody says something which isn't physical such as being alone, say something like "everybody you've ever known is in the cave and they are ignoring you". > Sam shouldn't enter the cave, but if he does you could refer to role-play earlier to think of a fear or just use spiders. > Rancid also doesn't have a set fear, but you could have it be anything. > Try and have every player enter the cave, this is a fun way to have character moments. So this encounter is basically a very easy version of the final encounter and is really only here both to prepare you for the final combat and also scare you for the final combat. When it starts you will see a ton of different spiders and you should note to your players these are not ageless spiders; just normal spiders. So, basically this is a crowd control encounter. Attempt to stop whole battlefield AoE with anytimes (a lot of these abilities such as Sharpsword / One's Sheath and Thane / Lightning Strike can be stopped by halfway through the chain having one of the small spiders use an anytime to dodge). And if you're really getting fucked by AoE abiltiies, have the minion spiders spawn and attack on the same turn. The gimmick of this encounter is that if you are surrounded by four small spiders you take forty damage and also death roll leading to a dangerous encounter. Show this by having 3 attack one player so they only take the damage, and then 4 attack something like Sam and have him do the death roll. In this encounter Sam gains bug spray, which you can use for him to clear out a ton of small spiders at once. I don't really give his bug-spray a maximum range or AoE but usually just five or six small spiders at once. 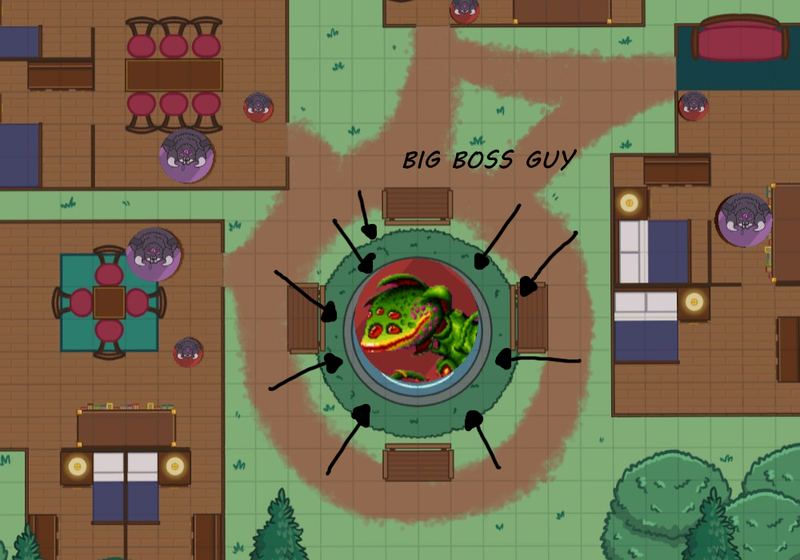 This is the final encounter of the campaign and it's revealed that instead of a large bug infesting the town you have a monstrous green plant. Note to the players that the plant is lying in a fountain, and if they roll well on inspection you can reveal the plants has roots to each four houses. These four houses will be spawning hubs for spiders. When the players reach this location, spawn a ton of spiders outside each of the houses. (Like probably six big ones and twenty little ones). So, there's a few things to go over here for this encounter which includes both the apple subplot from earlier and Sam Chuckle. If somebody has eaten the apple have them roll and sit out the first round of combat saying they are not feeling too well unless they roll a 20 or a 1. If they roll a 20, have them transform immediately into a large Caterpillar; this is the magic side-effects of the apple. If they roll a 1, have them also transform however tell them that they will be anti-party unless they roll well in resisting it at the start of each round. If they don't roll either one of those two have them transform on the second round and roll to see how they handle their 'new' body. If they roll badly, they are again anti-party until they roll well. 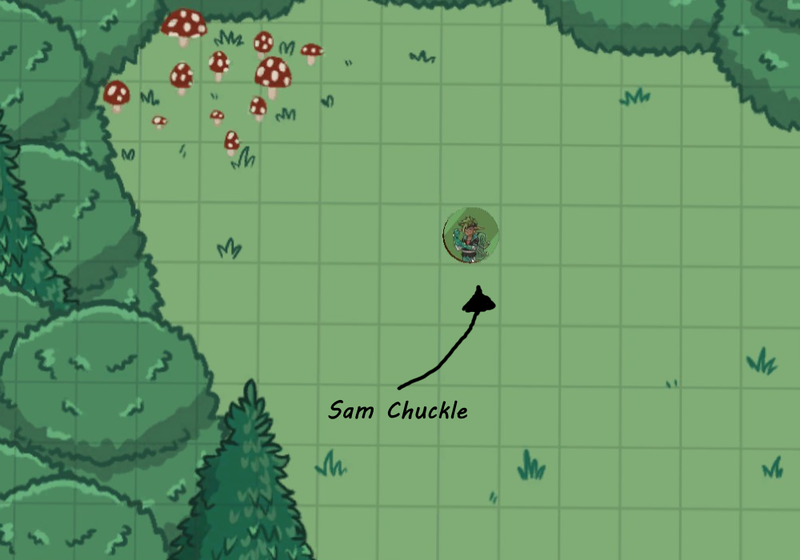 Sam Chuckle in the final encounter will be used to shut down the house spawning spots.. Have Sam move towards the nearest house and put down a pack which deploys a green mist. Have him take two turns for each house, aka first turn he places the pack and the next he activates it. If you roll bad and fail to place the pack. on the second turn just have him both place and activate the pack at once. Whenever Sam blocks a house with his green mist you no longer spawn spiders from there. You can also have Sam just use his bug-spray to try and take out some small spiders if the party is getting overwhelmed. Each house will spawn spiders per turn. The amount of spiders spawned depends on how well the party is doing and how many spiders are currently on the battlefield. 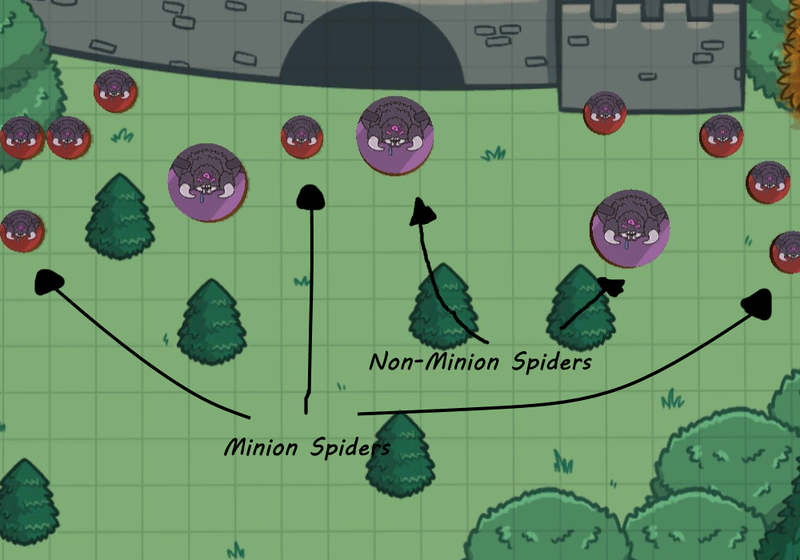 If the party are doing incredibly well and barely using their any-times have the spiders spawn and attack in the same turn. Houses can be deactivated by destroying the roots from the big plant to them in some role-play way or having the door somehow blocked off (however you can roll to see if the spiders break the wall and escape). I'd like to also say there is a large chance players enter the house. If this happens spawn an incredibly large amount of spiders inside the house (probably something like six/eight big ones and ten/twelve little ones). These work the same as last encounter, but I'd have them not spawn spiders and just spit/bite. Have them bite instead to do 40 damage if they are directly next to the players and also burn them. These work the exact same as last encounter and since there should be a lot of these on the battlefield they can overwhelm pretty easily if the players decide to just focus the boss. Anyway, at the start of each round this big plant will move everybody on the battlefield (this includes NPCs but not spiders). Describe this by him dragging you around with his roots. If somebody stands next to him, have him attempt to eat them with a death roll. You could maybe demonstrate this by showing the plant eat a spider before the encounter starts. If he eats a player successfully however, give him three bonus actions. Allow him to drag people towards him with his roots and also deal 50 damage in the process of doing so. Use this to anytime players using big limited actions or people who are getting too 'min-max'y and also use it as his general go-action if nobody is next to him. Thank you for reading! To end the campaign have the person who became a Caterpillar transform back into themselves (and have them coated in sick to add a little bit of humor/grossness to the campaign) . Tell them they can transform back into a caterpillar at will. You can also have this person then go back to the witch and train their powers. For the other players just have some role-play with Sam where you can discuss payment, notable events and whatever! If you have any questions about hosting this, just message me Thank you for those who played this when I hosted and specifically thanks to Meganzoor for the Art assets used. This campaign falls under the CC BY 4.0 License and can be used and edited freely as long as you provide credit! 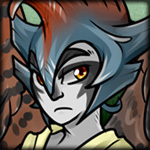 Alright, at last the finished version is up. That took a while and I totally wish I didn't accidentally press submit. I should maybe have another campaign up in a week or so depending on the reactions towards it. Great campaign bud! Twas a lot of fun to play!